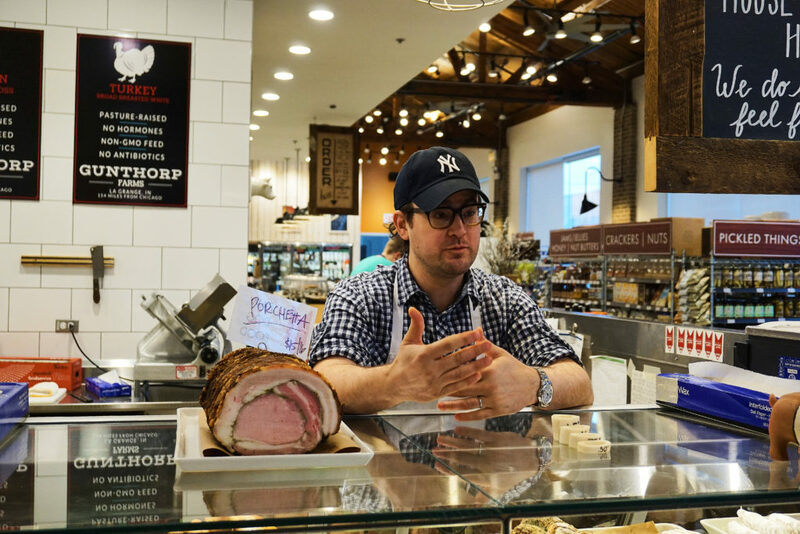 Rob Levitt’s status as a Good Food leader in Chicago crystallized after he and wife Allie opened The Butcher & Larder in 2011. 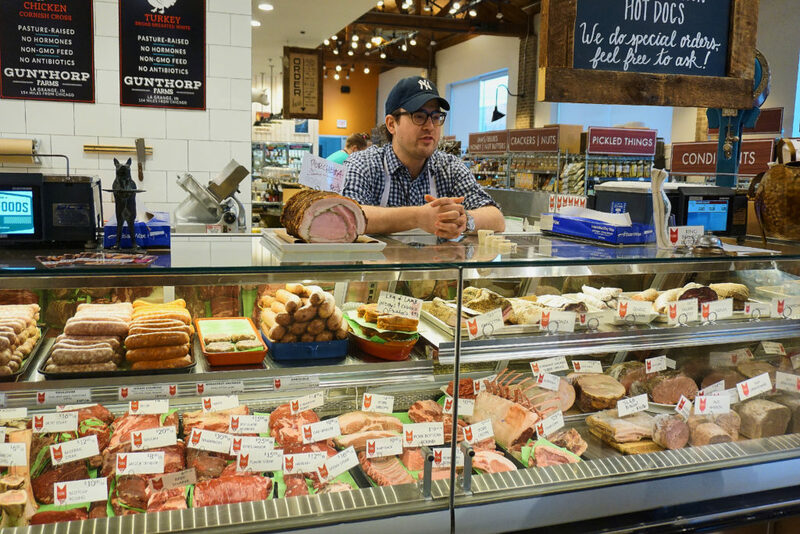 Started in a small storefront before Rob relocated to a much larger space in the Local Foods grocery store in 2015, The Butcher & Larder specializes in locally and sustainably produced meats, house-made charcuterie, and customer service that includes assistance in choosing delicious but lower-priced cuts that enable more consumers to eat Good Meat. But Rob also is an outstanding chef. He and Allie met as students at New York’s Culinary Institute of America, from which they graduated in 2001, and worked in New York City kitchens before moving to Chicago (Rob grew up in suburban Wheeling) the next year. In 2008, they opened Mado, a Mediterranean-themed restaurant that achieved critical acclaim, before opening The Butcher & Larder and focusing on Rob’s mastery of meat. And it will be in that chef role that Rob will be taking part in the Frontera 30th Anniversary Celebration, a joint fundraiser for Chef Rick Bayless’ Frontera Farmer Foundation and FamilyFarmed, which will take place on Sunday, April 30 at the Art Institute of Chicago. 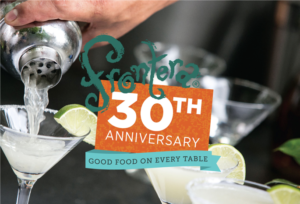 To learn more about the Celebration (which marks the 30th anniversary of Rick Bayless’ landmark Frontera Grill)… to buy tickets… or to learn about host committee and sponsorship opportunities, please click here. 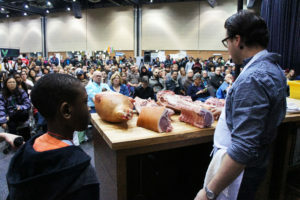 Rob will be a member of the all-star lineup of chefs who will make this one of Chicago’s most memorable tasting events, and that includes colleague Abra Berens, whose Stock Café adjoins The Butcher & Larder in the Local Foods store. Good Food on Every Table published a profile of Abra on March 27; click here to read. The following is an excerpted interview with Rob, which took place on March 25 at Local Foods. FamilyFarmed: For the Frontera 30 event, you’re going to be wearing your chef hat. Looking back, how did the perception of meat in restaurants change? That really shaped me as a cook. I went from thinking I was going to open this fancy fine dining place someday to wanting to open someplace which we did open, which was Mado, which admittedly and proudly was based a lot on Lupa, a lot on a place like Avec, those are the kinds of experiences that we had. 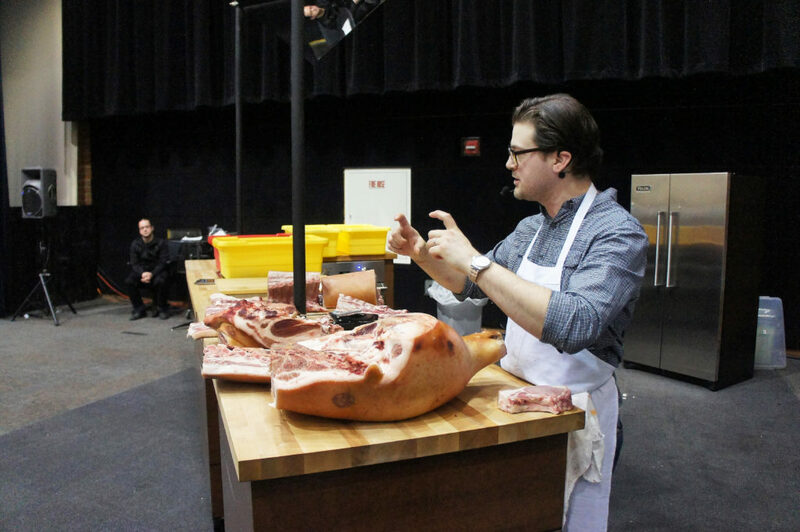 With that, it makes room on the meat end for things like braising a big chunk of pork shoulder or the porchetta. 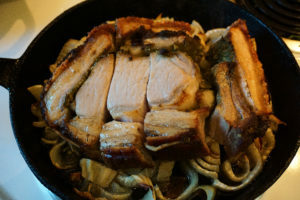 Doing that or doing spit-roasted legs of lamb or big stews and braises, some of these less common cuts that seem less luxurious, it’s not a loin, it’s not a tenderloin, but have all the flavor. They take longer to cook and they’re not as pretty. And doing things like making sausage and pates, that was the biggest change, that sort of middle-tier restaurant made room for all of those great cuts of meat. FamilyFarmed: People want the foods they are used to, they just want that better quality. Rob: Yeah, they want something they can’t get at home. In the case of what I do, I want them to get the same stuff that they eat out to cook at home. But sometimes that doesn’t always fit within their budget. So that’s why we offer so many different cuts. Maybe you can’t get the same pork chop that you had at The Publican because it’s expensive. But you can get a cut of pork from the same pig. That’s to me just as good, if not better. 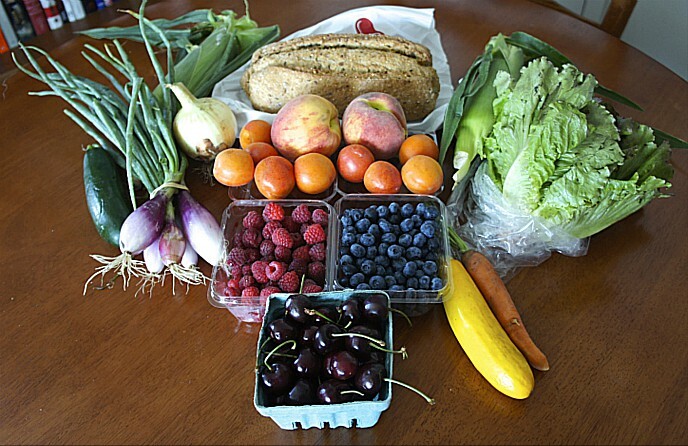 FamilyFarmed: When I’m talking about home cooking, I always say it’s all about the ingredients. If I can get a beautiful piece of meat from you and cook it up right, and roast some vegetables, I’ve got a restaurant-quality meal on my plate at home. Rob: Of course you do. People used to make fun of that sort of thing, people used to make fun of somebody like Alice Waters, and say what she does isn’t being a chef, that’s being a good grocery shopper… One of the basic things in being a great chef is knowing how to get really great ingredients. Obviously, what to do with them and how to train people, all that’s important. But none of that matters if you don’t have great ingredients. FamilyFarmed: And this kind of customer service is that educational part, where you can hold people’s hands and walk them through it. Rob: It is nice to talk to a customer and say, OK, this is what you really want and this is what you need to do, and have them be really into it. When you have the opportunity to talk people through how to cook a few basic things, they come back to you like you’re a hero. Really, I’m just talking you through something that used to be really commonplace. What it comes down to is so many of these cuts that you don’t know you treat them just like cuts that you do know. You’re going to take this chuck eye home and cook it exactly the same way as a ribeye. It’s much less expensive and it’s super delicious. FamilyFarmed: When you returned to Chicago [in 2002], what was the state of the Chicago food scene? Rob: It was actually very encouraging. It was a really cool time because you had a much younger Paul Kahan, Blackbird was taking the country by storm. I had an amazing first meal there. And just doing something different… What Blackbird was doing was taking the sort of pomp and circumstance out of fine dining much in the way that [Mario Batali’s] Babbo did in New York City… I say the same thing about a place like [Rick Bayless’] Topolobampo and now Frontera, how they can be going strong for this long because the person leading it is smart enough to look to the younger people to keep current. You can still maintain the integrity and the vision of the restaurant, but you can keep it current by getting people involved. 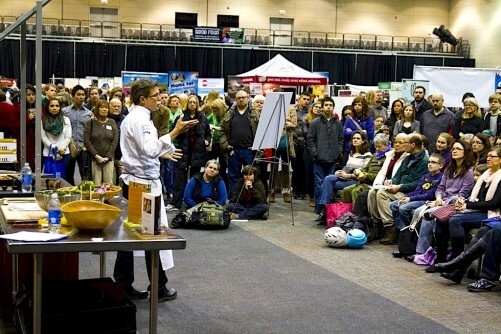 FamilyFarmed: Rick Bayless is credited with helping create the market for local small farmers through his sourcing practices and since 2003 his Frontera Farmer Foundation [which since 2003 has made nearly $2 million in grants to farmers]. Rob: It’s fun to see that kind of stuff and the evolution of that, and to see what guys like Rick did for the farmers around here. Look at Gunthorp Farms now. Greg is an amazing guy and he’s super smart and he raises amazing product. Would he be as prolific as he is now without somebody like Rick Bayless, and like Charlie Trotter in the early days and Paul Kahan in the early days? FamilyFarmed: Another thing Rick Bayless and Paul Kahan have proved is that if you treat the people who work for you decently, you’re going to be able to sustain this extraordinary success. Rob: There’s the Baylesses and the Kahans and these big guys who are kind of larger than life right now. But you’re starting to see some other people learning from that and trying to rethink the model a little bit. How can we translate this into what is needed now… Look at the number of people who have come out of a place like Lula Cafe. Jason Hammel [another participant in the Frontera 30th event] is really doing amazing things there. It’s such an amazing restaurant because it really is something for everybody, whatever your budget, whatever you want to get out of that place, you’ll get it. It’s kid-friendly, an amazing wine list, really interesting food. It’s both ends of the spectrum, and that balance is impossible, but they do it. This entry was posted in Uncategorized and tagged Abra Berens, Alinea restaurant, Avec Chicago, Babbo NYC, Blackbird Chicago, Charlie Trotter, Culinary Institute of America, FamilyFarmed, Frontera 30th Anniversary Celebration, Frontera Farmer Foundation, Frontera Grill, Giant restaurant Chicago, Grace restaurant Chicago, Gunthorp Farms, Jason Hammel, Local Foods Chicago, Lula Cafe, Lupa NYC, Mario Batali, One Off Hospitality, Paul Kahan, Rick Bayless, Rob Levitt, Stock Cafe at Local Foods, The Butcher & Larder, The Publican, Topolobampo. Bookmark the permalink.